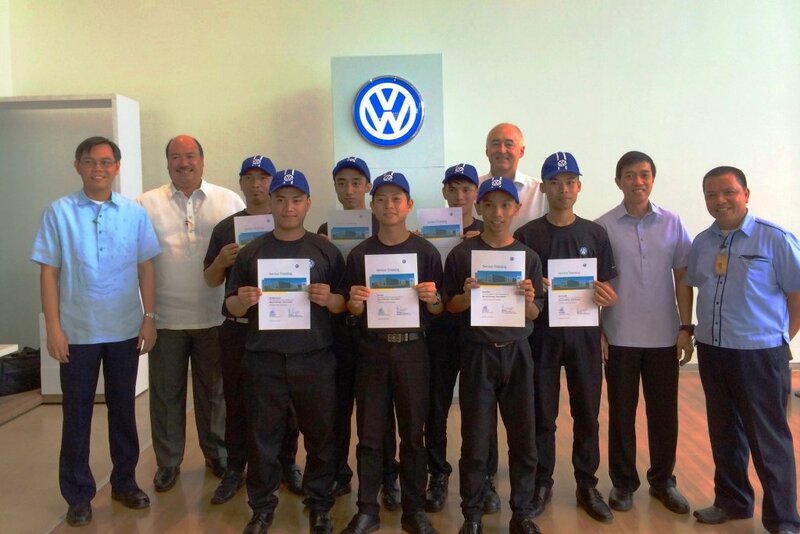 In simple graduation ceremonies held at Volkswagen BGC, the eight students, aged 18-21 years old, received their certificates of completion from Volkswagen Philippines’ President and CEO John Philip Orbeta and Chief Operating Adviser Klaus Schadewald. The graduates were carefully chosen for training from a roster of 40 pre-selected students of Don Bosco. Volkswagen Philippines, together with Volkswagen Group Regional Aftersales (VRAS) representatives and trainers, interviewed and nominated four students each from Don Bosco Makati and Tondo to undergo the TAP. Afterwards, the students, under the guidance of VRAS regional trainers, underwent two months of rigorous theoretical and practical training, which included modules on Volkswagen brand introduction, basic qualification courses, and the Volkswagen seven-core service process. In addition, the students also went through 900 hours of on-the-job training, which included job immersion in various sections of aftersales operations—from maintenance and repair of vehicles, to job control, to parts inventory and warehouse management, then to service advisor training. All eight students, namely Esthanle Lopecillo (Don Bosco Tondo), Joemhel Tuliao (Tondo), Levie Leguiz (Tondo), Joey Romero (Tondo), Aldrianne Arquita (Don Bosco&nbsp; Makati), Daniel Gonzales (Makati), Jann Patrick Matira (Makati), and John Michael Luanzon (Makati), successfully completed their courses, along the way gaining the admiration of their peers and mentors for showing true dedication to, and interest in their new automotive skills. In his remarks before the certificates were handed out, Volkswagen Philippines’ Aftersales Director Reginald See stated that TAP was about opportunity---opportunity for the students to learn and apply these knowledge in their work, enabling them to help themselves and their families. It was also an opportunity for Volkswagen and Don Bosco to nurture and continuously build on the partnership and contribute in giving these students a better future. After the awarding ceremony, Volkswagen Philippines donated several training parts such as base engine, alternator assembly, air-con compressor to Don Bosco Tondo and Makati. Fr. Martel A. Ramos, Salesian Priests of Don Bosco (SDB) Tondo, Fr. Jose Dindo S. Vitug, SDB and Engineer Armando Marquez, both from Don Bosco Makati, received the donations on the schools' behalf. In line with the three goals of the Regional Apprenticeship Program for New Technicians of the Volkswagen Group Regional Aftersales based in Singapore, the Volkswagen TAP in the Philippines would help: 1) achieve acceleration of the availability of new technicians; 2) create qualified, motivated, and loyal technicians; and 3) increase service quality and customer satisfaction. The Philippines, particularly its technical schools such as Don Bosco, has been eyed more closely by the Volkswagen Regional group for its technicians' apprenticeship program because of the students' and the general population's high literacy and educational attainment levels, proficiency in English, and the reputation for high motivation in study and work attitudes.